A beautiful weekend is in store for Big Bear Lake with late summer temps in the low 70’s. We have a slight chance of afternoon thunderstorms on Saturday, with fair skies returning on Sunday. On Monday, we welcome Fall officially. 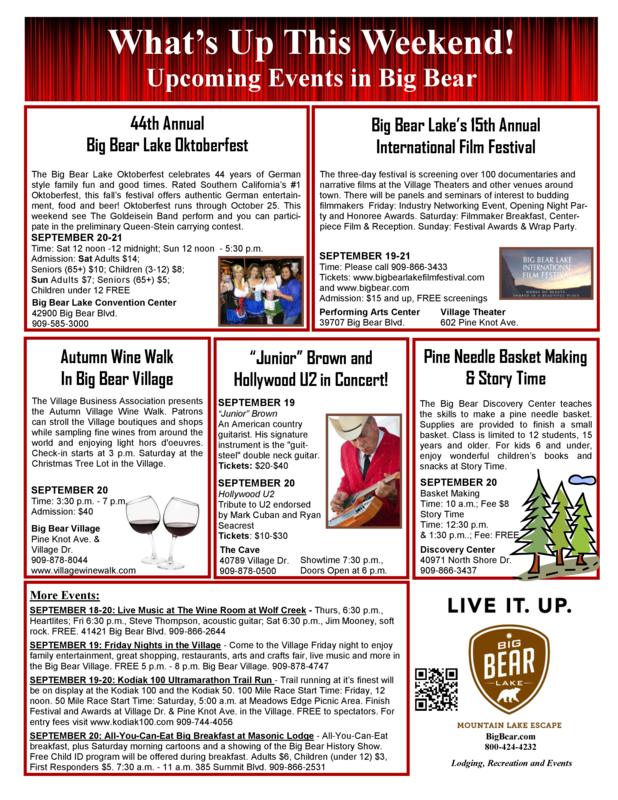 The International Film Festival and the Autumn Wine Walk are happening this weekend as well. Come and see what these fantastic annual events are all about! RS Vacations has cabins available and we are featuring lower off-season pricing as well as some awesome specials! Head over to our website and book today!! If you are planning to join us for the holidays, be sure to book your cabin with us soon, as our calendar is starting to fill up. Don’t miss your opportunity to experience the magic of the holidays in Big Bear. RS Vacations has all sizes of cabins with awesome amenities and un-matched customer service! You will not be disappointed!! Book a Big Bear Cabin today!